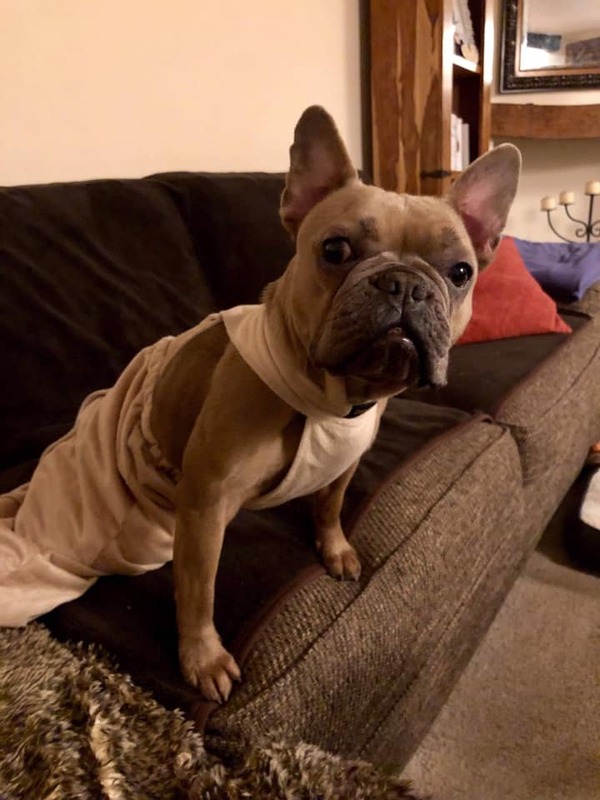 Penelope is a very special little lady and will require a very special home so please do read this post very carefully. When Penelope came to me, she was incredibly nervous outside and was not confident on her wheels at all. She is now very happy on her wheels and will go over to have them put on when I get her lead out. She prefers to wear her drag bag inside though and can get around the house very easily like this. I have done lots of work with her outside, but she is still nervous around dogs and other animals she meets out and about and will bark and lunge if they get too close. She has come on leaps and bounds and I am sure with more time and patience she will get there. Inside the house she is a dream, all she wants is cuddles on the sofa or will happily lay on her bed in the kitchen if I have housework etc to do. She is a really loving girl and gives the best cuddles, she wants to lay as close to you as possible. She also loves tennis balls and will very happily play fetch for 10 minutes or so. Penelope is also fine to be left for a few hours, she will sleep happily on her bed or chew on her antler and comes straight over to greet you on your return. I haven’t left her for more than 4 hours at a time. She is a bossy boots with other dogs and does not like to share toys, so ideally, she will need either a dog free home or one male dog only (preferably one that doesn’t want to play too much). She is great with children. She hasn’t lived with any in foster but has been tested with children as young as 2 years old. I would say that she would prefer to live with older children though as she likes the quiet life. She cannot live with cats or any other animals, she is very persistent and won’t leave them alone. Penelope is also doubly incontinent and wears nappies. These need to be changed every few hours and she does need bathing regularly (at least every other day). She does also need help emptying her bladder as she cannot do this by herself. She will wee in her nappies because when she moves; she will put pressure on her bladder but to fully empty it she needs help. This must be done to avoid any infection. It is very easy to do (I will show you how) and I do this with her when I change her nappy. Penelope has so much love to give and I will miss her terribly. Please also make sure that you have downloaded and submitted an application form into us.